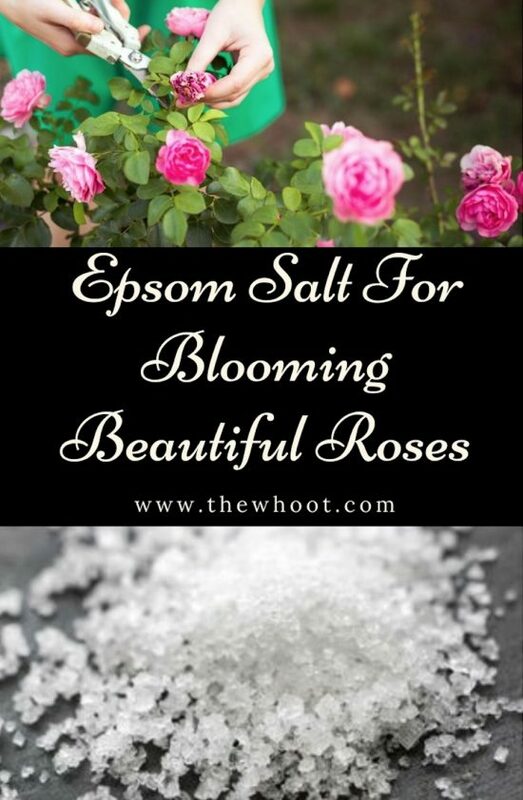 You will be amazed at the amount of Epsom Salt Garden Uses that there are and Roses are just one of many that we have found. Check them all out now and Pin your favorites. How would you like to improve your Roses by growing big beautiful flowers that were healthy and brighter? Well, now you can, and all the while using a very inexpensive, common household ingredient. We are talking about Epsom Salt. You may be surprised to know the positive effects that Epsom Salt can have on your garden. Did you know that it contains hydrated Magnesium Sulfate? One of the best ways to see the benefits that Epsom Salt will have when it comes to your Roses is to sprinkle a tablespoon around the soil and roots of your Rose Bushes once a week prior to watering. The benefit is that it significantly speeds up plant growth, which in turn, increases nutrient uptake. Another positive effect is that it deters pests. It also increases the flavor of fruit and veggies, and improves the colors and quantity of Roses. This also applies to other flowering plant blooms. Next time you are admiring beautiful Roses, chances are that’s their secret! Before using Epsom Salts in your garden, it is recommended that you test the soil for a Soil PH reading. 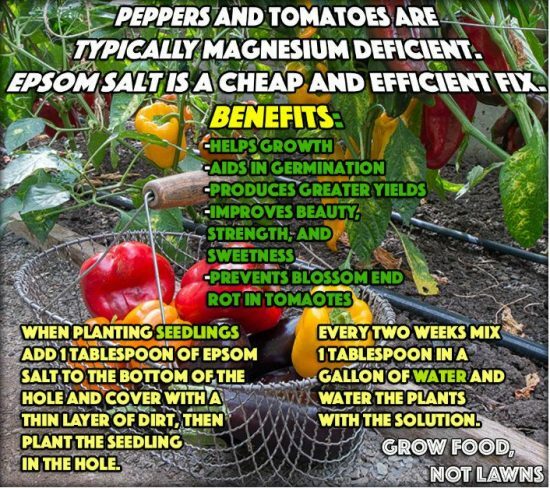 If you would like more tomatoes, peppers and roses, Epsom Salt should be added to your gardening routine. According to the ‘Food Not Lawns’, they suggest that every two weeks you should mix one tablespoon of Epsom Salt in a gallon of water. When you water the plants with the solution they will receive a wonderful boost. 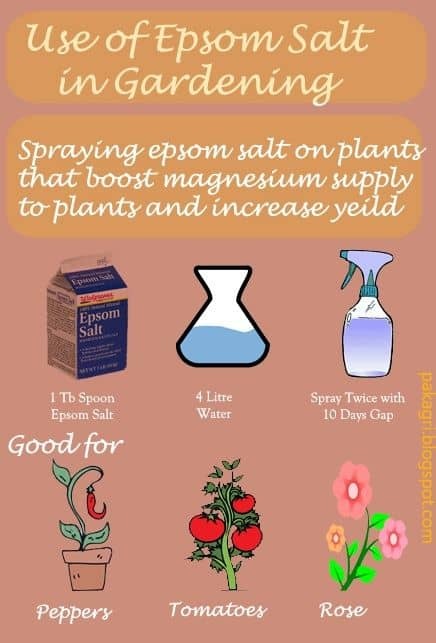 Another top tip is to add a tablespoon of Epsom Salt to the bottom of the plant hole and cover with a thin layer of dirt. You should then plant the seedling over the top in the hole. When you are working with established plants you want to be sure to add a top dressing of soil prior to sprinkling a tablespoon of Epson Salt to the surface of the soil as shown above. You should then water the Epsom Salt in thoroughly. About a month later you can apply top dressing again. You can continue this process for the entire growing season for your Roses. We know you are going to notice some big changes in your blooms. This Infographic from Pakagri Blogspot shows you correct measurements to use for your Peppers, Tomatoes and Roses. All you need is 1 tablespoon of Epsom Salt, 4 Litres of Water and a Spray Bottle. 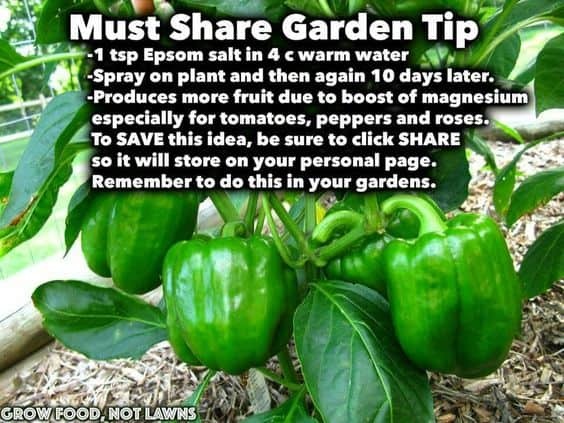 They suggest that you spray your plants twice and have a 10 day gap between doses. 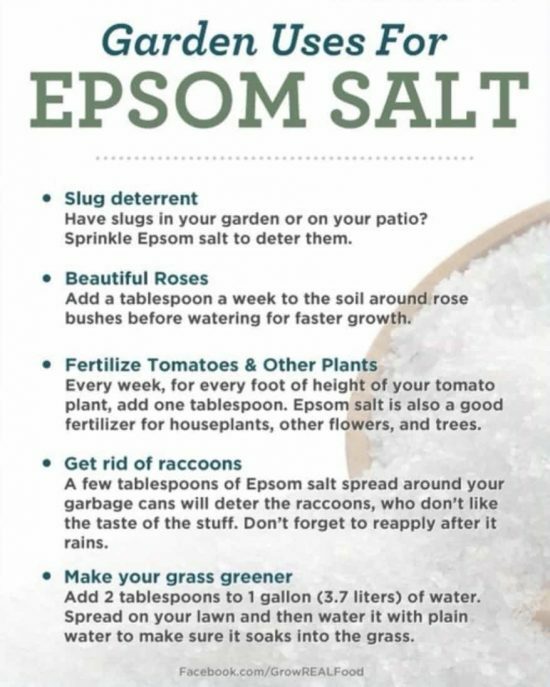 Our gardens are not the only ones to benefit from Epsom Salt. There are some substantial health benefits to us too. We thought we would share Dr Axe’s top 7 uses. We thought we would start by checking out some of the best benefits that Epsom Salt offers. You will notice that number one refers to it boosting Magnesium levels. There are also some handy human benefits like reducing pain and inflammation, eliminating toxins, relieving constipation, reducing stress and improving blood sugar levels. It will also have some great benefits for your hair. It acts as a natural volumizer and can help to decrease excess oil. Who knew! Learn how to make your own Magic Erasers and an amazing wall wash too. We have also included a pinnable chart with loads of handy ways to use them like by breaking off a piece and leaving it in your toilet overnight! You will love these great ideas and it will save you money. Don't miss this handy info! Wisteria is a beautiful flowering plant that's very easy to propagate and grow in containers. It's long living and very hardy and will brighten up any garden! Check out all the ideas now!